On Saturday evening, October 20, 2018, the Valley Arts Alliance produced the Season 7 Premier Episode of Alaska Home Companion—A Frontier Variety Show!, a rendition of a live radio broadcast from the golden age of Alaskan radio, with skits, music, and dance acts, similar to the popular Prairie Home Companion radio show on NPR. 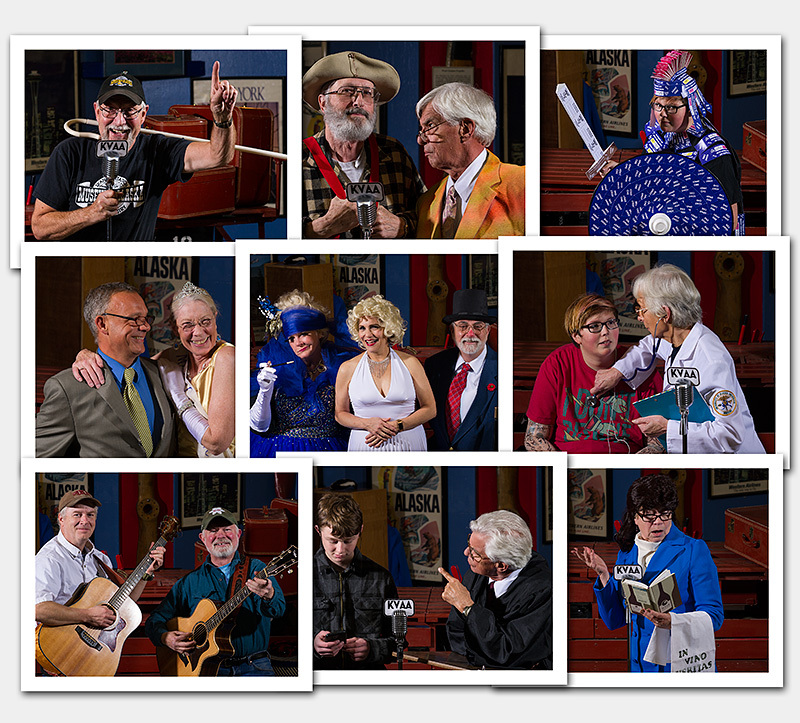 Alaska Home Companion—A Frontier Variety Show! features interesting stories by Alaskans about the best, the worst, and the silliest of everyday living in Alaska. The Season 7 premier episode featured Guy d'North—Private Eye, W. C. Fields, Miss Communication, Rhubarb Advisory Board, The Sommelier and news from Lake Willowa. This episode was “sponsored” by a variety of old-time Alaskan merchants. Featured guests introduced by Randi Perlman were the Borealis Dancers, consisting of Georgie Hollander, Cindy Montgomery, and Kelly Caraway; Marilyn Bennett; Richard Estelle; Doug Ferguson; Joe Fournelle; Tim Grady; Dave Glenn; Pam Huyck; Becky McLaughlin; Faye Palin; Ava Peticolas; Robbin Robbert; Hillary Saffran; and John and Joe Stroup. The Production Crew included Alicia and Lewis Allen; Jill, Trent, and Selene Farris; Josh Fryfogle; Gale Glenn; Sherry and Lonnie Jackson; Terry Koch; Jim Palin; Eric and Carmen Summerfield, and Kathi VanZant; and Cary Bolling of KVRF 89.5FM. The Season 7 Premier Episode of Alaska Home Companion—A Frontier Variety Show! was held in the famous Museum of Alaska Transportation and Industry in Wasilla, and was broadcast live by Radio Free Palmer on 89.5 FM, and is available on their website. The Season 7 Premier Episode was sold out—another example of bringing our community together through the arts!